I am no longer maintaining this addon on this site. Please visit Curse http://mods.curse.com/addons/rift/indy to download the latest version and post comments. i have no clue what is happening or what i am doing wrong, but for the past 3 months and even yesterday or today, whenver I d/l the file it is always, and i mean always giving me the stupid SERVER edition which is not what i want. I asked you before to check on this file from here.. Is this something I am doing wrong, or something not right with the file? I use to love this program but i have not been able to use it for months now. Last edited by ShinyHunterShomar : 01-01-16 at 02:16 PM. Will you be updating soon to include the following Fae Yule sets? Also I noticed that Vampire Sheep shows on the addon as having 2 sets to collect it for but in game there's actually only one set: Unstable: Vampire Creatures of Tammark. Both should be fixed in 1.1.14. I'm curious where you got that from? I checked the latest RiftDiscovery zip and it's not in there. I went into Rift, opened the character page, went to the artifacts tab, searched for Nightmare: and checked all the ones in game, were in the addon file. 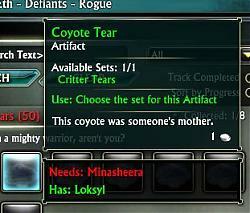 When I found one that wasnt, I found the artifact IDs and posted here. I know this.. I think you have the server edition as your d/l file on both this (regular) and (server) listings. I cannot d/l a regular updated version, only a server version keeps d/l.. Have you looked recently to check on the downloaded file here when you click d/l to see if its the normal one? Just d/l it again and it is the server version. It is the exact same size. It has been this way for over a week now. You can't go by file size since they're nearly identical and differ only by a single word. ["I4A4B64628714C3EC,2776F68256B606E6,,,,,,"] = true, -- Snakes! I started using this addon and noticed that the icon for it is almost off the screen on the bottom left right below my chat window. Is it possible to move it around at all? I tried clicking and dragging with: left mouse, right mouse, shift, control and alt for both mose buttons. Last edited by Aphrodite : 10-12-15 at 04:27 PM. What i might be noticing, and forgive me but I am not good at computer stuff, is that the size of the SERVER edition and the regular one are the same size? I also keep getting errors which I will show below and when I open up the ERROR report it shows me that I am using server 1.9 etc. I have tried d/l all of the ones on this site and on Curse and they all seem to be the same exact size. so, my question is this. When I log into my main character on my main shard, it DOES NOT show me all the other characters on all the other shards, even when I log them in. It only shows me the one character on my main shard. SO i cannot open the settings box and say - REMOVE for all the low alts on each shard. Does this make any sense or can you look more into this? So for now, i simply cannot use it to help me. thank you again. Ok, first off, if you want to be able to see your characters on other shards you do NOT want to use the Server edition. 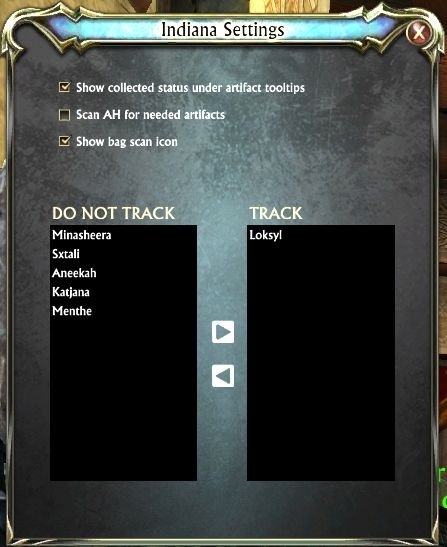 That version was specifically created to isolate each shard to allow the addon to work with characters with the same name on different servers. I will see if I can replicate the performance warning, but due the nature of that bug it is incredibly hard to replicate and it will (in theory) sort itself out as Rift downloads data in the background. I hope this helps. 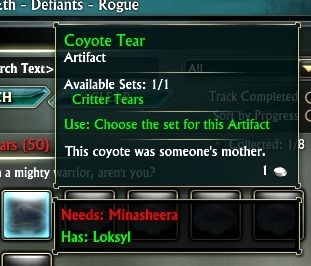 I am planning a refresh of the artifact database soon (TM), but I plan give it another week to allow the Rift discovery file to have the most up to date information. I'm not sure I understand. Are you saying that only the new items are not showing up as needed? Or are you saying that all artifacts are not showing up as needed? I just logged in and I did not have any trouble seeing the need/have categories in the auction house.